Motto: Go get 'em, Izies! Isengard, formally Sarumanian Principality of Isengard, is a prosperous city-state in Middle-earth. Isengard is mostly populated by Orcs and Uruk-hai, who are collectively known as Izies. 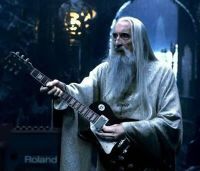 Saruman is the supreme leader of the state and the uppermost religious leader. Isengard has a rich history, spanding many centuries. After the destructive War of the Ring, it has become a major financial centre of Middle-earth. Isengard is near to Fangorn Forest, which is very bizarre, as we all know. Walking trees, cornivorous plants and genetically modified animals live there. Perhaps the most interesting creature is the yummy-yummy plant. 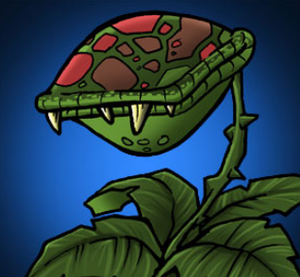 Those carnivorous plants are the cause of death for over 30 Orcs per year. What is more, there are many poisonous mushrooms and berries, ideal for poisoning your enemy. Until recently, historians believed that the area near Isengard wasn't inhabited before Men. However, new excavations, financed by us, proved the opposite. Many tribes of Oompa-Loompas settled here, building numerous villages. They lived in straw huts and tunnels and made fine pottery. After some decades though, they left and went to work in Wonka's Chocolate Factory. Soon, a Hillbillies caravan came and settled the area. They were Protestants and thus were the first Christians of Middle-earth. They had a peacefull life, growing crops (chiefly banana and avocado) and going to church every Sunday. The Hillbillies multiplied quickly and this made their Gondorian neighbours nervous. For those without comedic tastes, the so-called experts at Wikipedia think they have an article about Isengard. Without a warning, the Gondorians attacked the Hillbillies and drove them out. In that way, Gondor extended its borders and came closer to Rohan. A fortress was built, in order to guard Gondor from Mordor, as well as to prevent illegal immigrants, mainly Hobbits. At its centre stood the Tower of Orthanc, the garrison's headquarters. Shortly after, many people looking for a quiet rural life instead of Minas Tirith's hustle and bustle came to live in Isengard. Initially, the land around Isengrad proved really fertile. The new habitants grew many crops and a lot of businesses were founded. Isengard became a wealthy town and was expanding more and more. The Orcs feared of the powerful guards and the illegal immigration was decreased. The powerful guards were lead by a hereditary captain, origined from New Zealand. During its development, was evident that Isengard had become openly hostile to Rohan. But this was a situation the Rohirrim couldn't tolerate for a long time. So, they took their horses and attacked Isengard. They blockaded it and eventually took it for themselves. In fact, the Rohirrim wanted to teach the Gondorians a lesson, so they gave Isengard back to them. Gondor did not wish to relinquish its claim to the fortress, but at the same time lacked the strength or inclination to garrison it. A solution presented itself to the Steward of Gondor as Saruman suddenly appeared and he offered to guard Isengard. The Steward gladly gave him the keys to Orthanc, telling him: "I know thou will prove a usefull ally". Saruman settled there and rebuilt the destroyed town. Later, taking advantage of Sauron's return and the resulting distraction of Gondor and Rohan, Saruman took Isengard for himself and was self-proclaimed 1st Count of Isengard. During the War of the Ring Isengard was Saruman's base of operations against the Rohirrim, and he defiled the valley, cutting down its trees and damming the Isen. He then started breeding Uruk-hai and smithing weapons. Isengard became home to countless Orcs, whom Saruman used to try to conquer Rohan. Eventually an army of Ents led by Treebeard attacked Isengard, taking the fortress, although they could not take Orthanc. The Hobbits Meriadoc Brandybuck and Peregrin Took, as the new door-wardens, received King Theoden of Rohan, Aragorn and Gandalf at the gates. After the War, a treaty between Saruman and the allies gave him the right to keep Isengard, without any warrior. Saruman had decided to stop any warlike thought and to focus on Isengard's development. He invited many multinational companies, such as GlaxoSmithKline and Apple, to invest in the city. After a spell elections, he became the supreme secular and religious leader of Isengard. Despite a period of stagnation, the economy of Isengard began to recover. Soon after, the city saw days of glory and developed in many fields, including economy, music and sports. Today, Isengard is one of the richest countries of Middle-earth and everyone seems to forget about what Saruman had done.